What’s hidden? How on earth can they have a fresh product filled with meat or poultry stocked on the shelves….and NOT in the fridge, without any preservatives?! The lovely team at Caveman Food sent me their range to try share my thoughts on it with you. I was expecting a cold delivery with ice packs and all, only to have a nice gift box land on my desk instead. After the momentary confusion, and the double checking of the labels. I was so excited to bring them home and try them out. Ready made dishes in a shelf stable bag that are paleo, gluten free, dairy free, contain no added sugar, preservatives, or artificial ingredients. HOW CAN THEY STAY ON THE SHELF? It’s called High Pressure Processing (see the machine here) and the cool kids in the healthy food manufacturing world are using it to bring us healthy, delicious food without the need for preservatives and other unwanted ingredients. As busy shoppers, it can be a challenge to read every label, let alone do research to find out where the product was made and how the ingredients got there. Or in the case of meat products, how they were treated beforehand. But the team at Caveman Food source the good majority of their ingredients from Australian farms and list them all here. They use ethically sourced, free range and grass fed meats. And fresh vegetables from our local farms. How great is that?! Seriously, delicious. It’s like a home cooked meal that someone else made you. Like leftovers from an awesome dish you made one night that you found in your freezer, but instead, you keep in your pantry. Think of hearty stews, full-bodied flavours, and comfort food that won’t go straight to your thighs. Heat and eat my friend. It’s so simple. Heat in the bag or over the stove. Eat as a soup style dish, or add more chunky vegetables to give them some extra texture. You could also use them as a bolognese with some zoodles. If you’re not paleo, they go great with a piece of toast, gluten free pasta, or with a side of extra veggies and rice (or you can use cauliflower rice). If you’re like me, weeknight dinners are a hassle most nights. I’m often starving before I’ve had a chance to create something nourishing, and more often than not, I’m creating something for one, so having these packs on hand in the pantry make things so much easier. They’re super versatile and have saved me lots of time. The Caveman Food crew say you can even eat them straight from the pack, without even heating it up! The Caveman range is stocked in gyms, health food stores, supermarkets and online retailers. Find out your nearest stockist here. Or shop online. There are 4 super tasty flavours. Free-range Chicken (27%), Sweet Potato, Butternut Pumpkin, Chicken Stock (Chicken, Water, Spices), Broccoli, Spinach, Green Olives, Onion, Extra Virgin Olive Oil, Garlic, Naturally Fermented Lemon Rind (Lemon, Salt), Herbs, Spices, Salt, Water Added. Nothing suspect to see here! All their products are free from dairy (lactose free), grains (gluten free) and legumes. Unfortunately, the only downside is that those with IBS or FODMAP sensitivity won’t be able to tolerate them as they all contain onion and garlic. And you might like to add some extra vegetables to boost the fibre content. UPDATE: Fibre content ranges from 7-16g, the most being in the lamb, and the least in the chicken. The lamb has a good amount, but for the others, add some extra vege to bring it up a little. 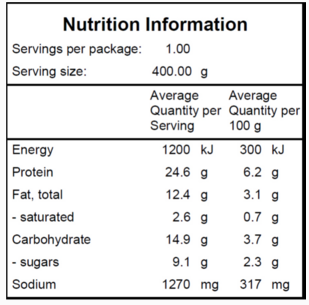 Nutrition: 9/10 – All flavours have around 20g of protein to keep you feeling satisfied. They also have wholesome fats and contain carbohydrates from vegetables. The lower than usual carbohydrate amount allows for flexibility if desired – a piece of toast, some extra rice, some added chunks of potato. Or keep it low, depending on your needs. Plus, no preservatives and no artificial ingredients make them a great choice. I’d just like to see the fibre content, and see it sit around 10g or more. Taste: Bold, punchy flavours. The beef has a strong smoky flavour, and the pork was quite sweet from the pineapple. The chicken has that nice kick from the olives, and the lamb was devoured by my partner, but I don’t eat lamb, so I can’t tell you the exact flavour of that. Cost: Order online and save the more you buy. You can order a 2 pack for $26.00, a 6 pack, or a box. Availability: Stockists here. Shop online here. Definitely a pantry essential for those late night dinners, lazy nights or camping trips!